It took 22 trains and one week to transport the proud and cocky division to Camp Polk in the west-central area of Louisiana. This was the home of the armored forces and it would not take long for the two units to clash. But first, they planned to enjoy the improved living conditions and the 3.2 beer. They found time to “hit the town” and often it was a place called “Scotty’s,” just outside of Southern Pines. The tank units did not take kindly to the finely tuned troopers who were in the best shape of their lives (and they knew it!). The 11th would often “unboot” the tankers when they were in town, forcing them to return to base barefoot and find their footwear neatly lined up in their barracks. Beginning Jan. 10, the men underwent harsh training in preparation for the tests at the hands of the Third Army. The Louisiana Maneuvers began Feb. 5 with the troopers bivouacked near Hawthorne, LA. There were 4 tactical maneuvers lasting 3 days each. First, they jumped and marched immediately after. Then they attacked and defended using an attack sequence of “flags & umpires.” Finally, the “enemy” broke through and they would retreat. The weather in the Calcasieu Swamp was snow, hail, sleet and enough rain to swallow a jeep. The men joked that the camp should be a naval base. On Feb. 20, the 11th airborne division took and passed their infantry tests. About this time, Gen. Swing was pleased to be told that the troopers were being sent to the Pacific and MacArthur would consider the unit his “secret weapon.” This turned out to be one reason for the lack of newspaper coverage for the division until they landed in the Philippines. I discovered this after an extensive search in the Australian library and newspaper archives. The 11th was restricted to base for one month. 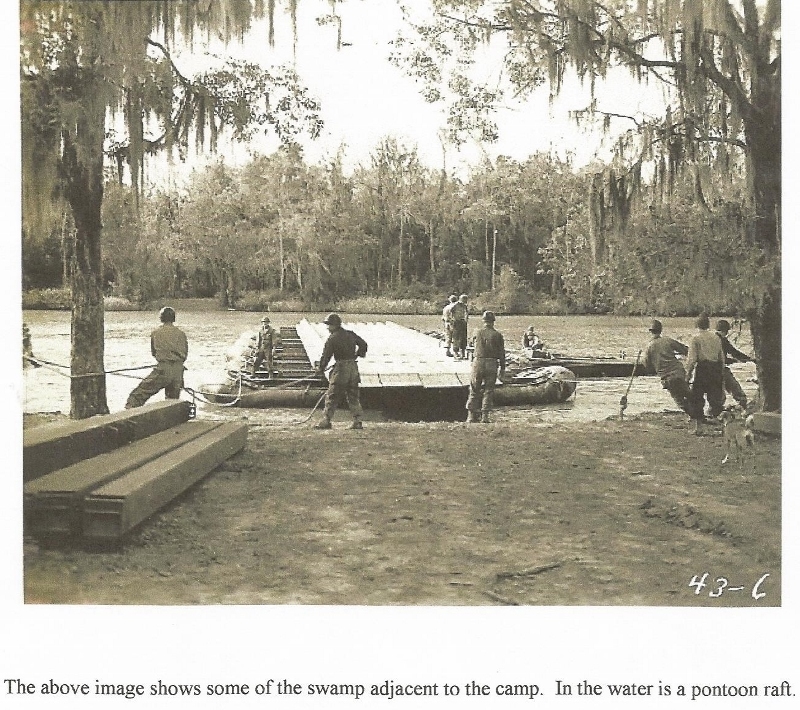 Swing decided the men should travel to their POE (Port of Exit/Entry) Camp Stoneman, CA incognito as Shipment # 1855 in an effort to bypass the Inspector General’s men. Orders were to look and act as a “straight-leg” unit; ALL paratrooper I.D. and clothing to be stowed away. News from home: The Banner (Broad Channel newspaper sent to servicemen) reports: NY Governor Dewey signed a bill that would allow fishermen of Jamaica Bay to shoot an unlimited amount of eels, but the shooting had to be done with bow and arrow. Smitty’s mom says: everyone is still trying to figure that one out. Fellow blogger, Carl D’Agostino at “i know i made you smile”, sent me his father’s pictures and information. Arthur D’Agostino had been with the 8th Armored Division. 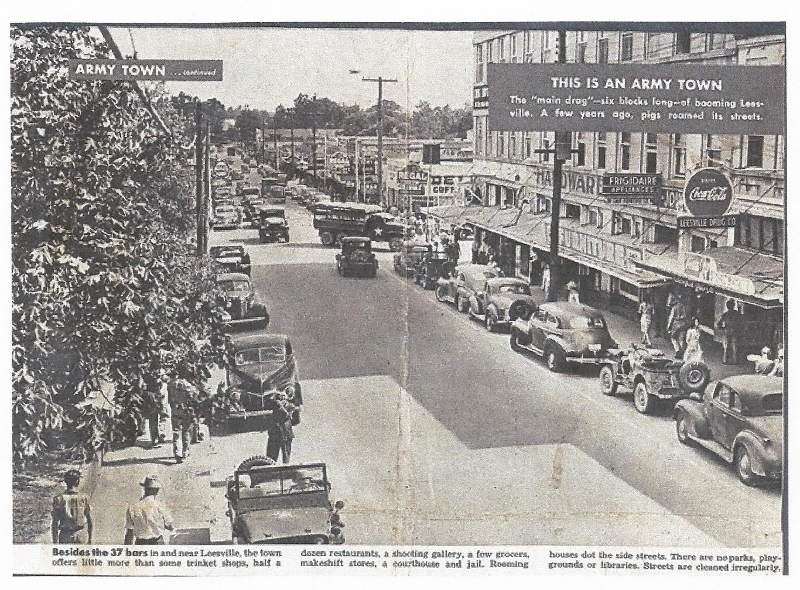 They were stationed at Camp Campbell, KY until 1943 when they were moved to Camp Polk, LA to prepare for combat. The division was sent to the European Theater on 5 December 1943, but Mr. D’Agostino was in recovery from surgery and was spared the journey. Carl’s blog can be found HERE. The 8th up for inspection. Everett Smith served with the Headquarters Company, 187th Regiment, 11th A/B Division during WWII. This site is in tribute to my father, "Smitty." GPCox is a member of the 11th Airborne Association. Member # 4511 and extremely proud of that fact! Posted on October 2, 2012, in SMITTY, Uncategorized, WWII and tagged 11th airborne, 11th airborne division, louisiana maneuvers, paratroopers, WWII. Bookmark the permalink. 18 Comments. Just wonderful. I wish dad had the eyesight to see it but I will explain it to him. He will be pleased and grateful. By the way I would never delete a pingback to your most honorable blog. I don’t do blog roll anymore but I hope people visit here. As a matter of fact I hope you would consider a guest post with article and pics of your choice. We must communicate about this. Bit by bit, I’m getting the whole story! Had to agree with your mom on that headline story in the newspaper for the servicemen – Really what were they thinking? Thanks for stopping, Bev and taking the time to read the whole story. Aside from my writing ability, it’s not bad, eh? You do tell a good story, and there is absolutely nothing wrong with your writing ability. I have always enjoyed real life more than fiction! The images on this post are not accessible. In the beginning, I don’t think I want putting them in correctly and remember, I ended up having a problem with the ‘New Post’ program that even Word Press didn’t understand. 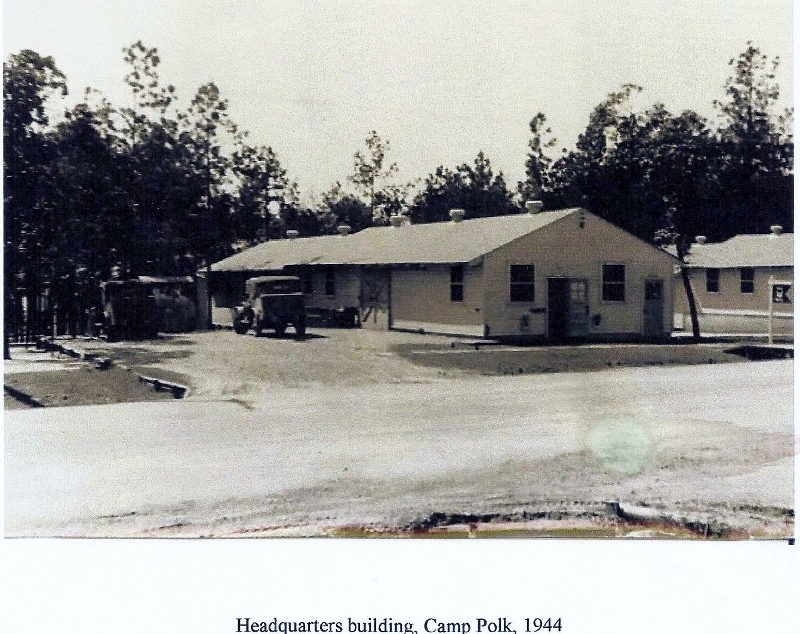 My father served Camp Polk 1943-44. He was a middleweight boxer (not pro) and gave exhibitions around the camps. Arthur R . D’Agostino. Tank Sargent. He just turned 89. Please – tell us more!! What unit was he in, etc. Army historian Eugene Piasecki is working on compiling all that is known about Camp MacKall, as records and buildings been destroyed over the years. You should record your dad’s service and please give him my Thanks for his service. I am retired high school history teacher from Miami Dade schools and will get to work on a history. Father used to hang out with Sugar Ray Robinson as they both were boxing with New York City Police Athletic League as teenagers pre war. A history teacher!?! I certainly hope you will record his stories and let me hear them. I want to hear their remarks, find out if any mistakes were made, and for them to add what they know. Thanks for the compliments! My father knew how to express himself, but I am not a professional writer. An editor would have a lot of work on his hands if he picked up my manuscript. I adore your blog, it is hilarious! Stories like this is the back bone of many units and the strengths between brothers in arms. I feel honored that you consider this post should be included with yours. I’ve been on on your blog and it is wonderful. It is nice to read about other soldiers experience on the Tennessee Maneuvers. I am working on my father WWII letters written to his then fiance, my mom. He is with the quartermaster and is transporting supplies and men to the Louisiana maneuvers in 1943-44. This is the second time they have been in Tennessee for field maneuvers. If you are interested stop by my blog and you can read about his experience there. I did not see what year you were talking about here. But I recently uncovered that the end of 43 the railroad workers are talking about striking and President Roosevelt had the government take over the railroad rather than face a walkout. It was said that the strike put the military six months behind schedule.